Communique Direct Mail Marketing & Printing, in Virginia Beach, VA, has been providing mail and print services for nearly 40 years. Clif Smith and his wife Sharon purchased a small mail house in 1979 and have grown it into a multi-million dollar company. We recently spoke with Clif, who told us how they've transitioned from presses to digital, and how automation has reduced their staff workload. The Formax ColorMax8 and 6306 Inserter have been essential tools to improve productivity and profitability. When Clif considered the switch from presses to digital, he explored inkjet printers, but didn't want to be limited to monochrome printing. With print jobs like bags for a local popcorn producer, and windowed envelopes, he needed a printer with versatility and a lower cost per piece. His friend Chris Strickland, a Formax Dealer from Coastal Business Solutions, suggested the ColorMax8 digital color printer. The ColorMax8 prints on media up to 3/8" thick and its Memjet inkjet print head produces no heat. This makes it safe for printing standard windowed envelopes, as well as ideal for the popcorn bags which are thicker and have a glassine window. 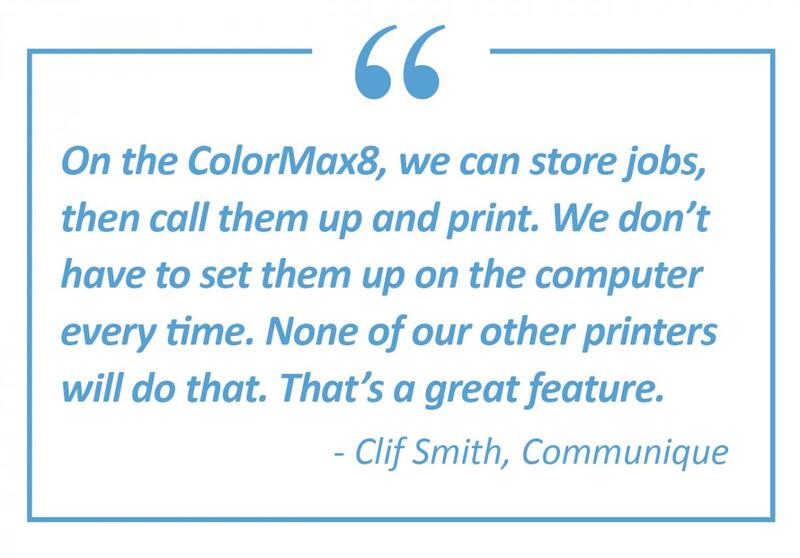 Clif anticipates future jobs for the ColorMax8 could include printing small boxes for business cards and invitations. "One feature I really like is that we can store the job on there, call it up and hit Print," Clif said. "We don't have to go back and set it up on the computer every time. None of our other printers will do that." The ColorMax8 touchscreen control panel stores up to 60GB of print jobs, as well as providing image preview and system status. Clif said cost savings are an added benefit with the ColorMax8. A typical envelope printing job could cost up to 6 cents per piece using a laser printer, compared with half a cent per piece on the ColorMax8. They can also safely print standard window envelopes, which are less expensive than laser-safe envelopes. As a mail production facility, Communique was in need of automation. The Formax 6306 Series Inserter fit the bill, making a big difference in labor costs. Large mailings used to require a team of people to collate, fold, nest, stuff and seal envelopes. Their only automation was a 2-stage swing-arm inserter, which required specially-trained staff to operate. Now, Clif says "the 6306 Inserter will take sheets 1-2-3-4-5, fold them, stuff them, seal the envelope...it's done." 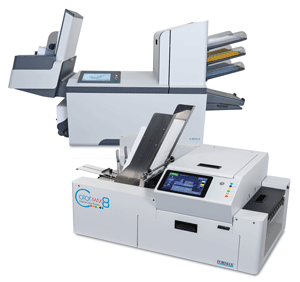 The 6306 Series features a color touchscreen control panel, 25 programmable jobs, easy-load envelope and insert feeders, and a high-capacity vertical stacker which holds up to 500 finished envelopes. These make it much easier to operate than a swing-arm inserter. "Anybody can run this Formax inserter, including the part-time staff. It's great," he said. Typical jobs now take fewer staff and a third of the time required to process by hand. With innovative features and user-friendly interfaces, the ColorMax8 and 6306 Series Inserter have helped Communique streamline their mail and print processes, saving money and allowing their staff to work more efficiently.